The name sounds frilly and feminine. TOday, most people have come to know Charlotte Russe as the trendy store for the contemporary fashionista. I know Charlotte Russe as a yummy desert invented by Marie-Antoine Careme in the early 1800’s. He used the name Charlotte for a young child princess he had at one time baked for. Russe came from the fact that his present employer was a Russian (thus cleverly avoiding any hurt feelings). You have probably seen Charlotte Russe on menus in fancy restaurants. It is usually surrounded by lady fingers and inside are layers of sponge cake, custard and or fruit filling. Charlotte Chantilly is another pretty version of this dessert where the entire cake is covered with Swiss jelly roll slices. In the 1930’s, 40’s, and 50’s in some bakeries in New York City, Queens, and Brooklyn - Charlotte Russe became a popular individual dessert in a small pretty cardboard cup. It had the same components as the larger version, only you could push the bottom of the cup up so you didn’t even need a fork or spoon! There was an old German Bakery near my house that still made them into the 1960’s until they closed. It was fun being treated to a light refreshing and, oh so fancy, and delicious treat! I found these pretty pink and white cups at Sur La Table and they reminded me so much of the Charlotte Russe cups I once knew. I bought a package of 24 lady fingers and split to down the middle to expose the interior. Then I brushed them lightly with a mixture of 1/3 cup Grand Marnier, 1/3 cup corn syrup and 1/3 cup of water. I also cut them in half because the cups were short. I even dipped some in melted chocolate. 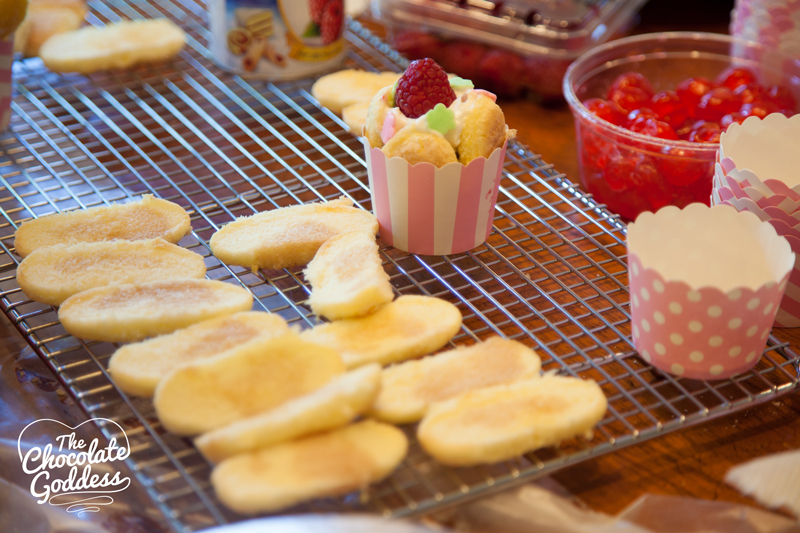 Then I lined the cups on the bottom with pieces of mini sponge cakes from supermarket intended for strawberry shortcakes. I also sprinkled the pieces of sponge cake with the Grand Marnier syrup. I surrounded the cup with the sliced and divided ladyfingers. Next, I layered raspberry pie filling, orange marmalade and whipped cream and topped them with a cherry or raspberry. Use colorful candied chocolate and sugar candies to decorate! Chill a metal bowl and then beat until soft peaks form. Make sure when you melt your chocolate you do it on 50% power for 30 second intervals and stir in between. Don’t completely melt it or the chocolate will be dull. Leave little bits of chocolate and stir until completely melted. BE – Goddess, make them for our friends and family!